State of New Jersey, 01.03.1872, 7 % Income Bond über US-$ 1.000, #179, 27,5 x 36 cm, schwarz, beige, rot, Knickfalten, beschnitten, Erhaltung VF, KR, Vignette mit Wappen von New Jersey (Mitte), links Zug und rechts landwirtschaftliche Gerätschaften, imprinted revenue RN-Q1 (links) und RN-W2 (rechts), nur ein weiteres Exemplar (#5) bei Cox gelistet, US-Railroad-Bond der Superlative aus der Sammlung Tankred Menzel! 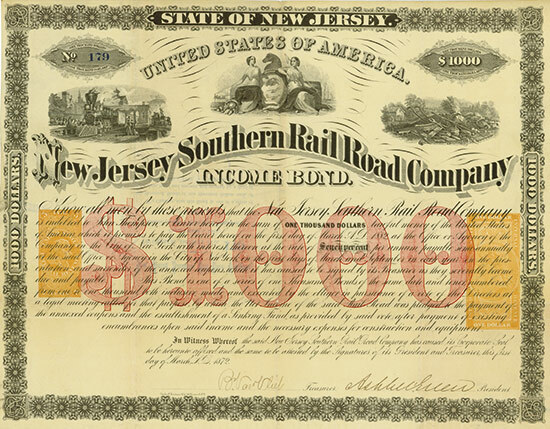 State of New Jersey, 1 March 1872, 7 % Income Bond for US-$ 1,000, #179, 27.5 x 36 cm, black, beige, red, folds, trimmed, condition VF, rest of coupons, vignette with New Jersey state arms flanked by a train and agricultural implements, imprinted revenue RN-Q1 (left) and RN-W2 (right), only one more certificate (#5) listed in Cox, Premium Railroad Bond from the collection of Tankred Menzel! Die Hauptlinie der Bahngesellschaft führte von Long Branch nach Atco in New Jersey. 1879 kam die Linie zur Central Railroad of New Jersey. The main line of the rail road led from Long Branch to Atco in New Jersey. The road became part of the Central Railroad of New Jersey in 1879.